The Pareto principle was a theory by Vilfredo Pareto which is now a popular concept of personal time management. He was an economist who theorized that 80 percent of all the problems that people encounter results from 20 percent of all causes. This may look like a theory that is too difficult to apply when it comes to the subject of personal time management. However, the term "Pareto 80-20 rule" can be very beneficial to you when applied to problem solving of any form. Throughout history, man has sought to develop new ways in order to record, track and make use of time better. From the invention of the sundial to the creation of the modern day calendar, the need to responsibly understand and manage time has been a concern for people. That is both in their personal and professional lives, that’s why different techniques and principles of time management were invented such as the Pareto principle. In order for you to effectively utilize your time, you must know this one significant step for doing it. This is important for the Pareto principle to work. You must learn this with wisdom to identify the "repeated patterns" in your daily schedule that may be causing problems to your productivity. If you’re using a time journal or a time planner such as daily planners and weekly planners you may notice in your records that certain blocks of time are not being used to their fullest potential. Once you identify and know these blocks of time, you can begin to make some important changes in your daily routine. It would be better for you to start with your morning routines as it may affect the rest of your day. You should identify the possible things that may be taking your time and slowing down your progress. It can be physical problems such as a lack of means or resources. It can be emotional and psychological problems like stress and anxiety or even depression. Or it can be about spiritual matters. The principle of Pareto for effective time management is a rule that simply means that if you can properly identify and change only 20 percent of the causes of your problems. That is in your present personal time management system and you can eventually fix the 80 percent of those problems that make it difficult for you. Here’s a good example, try to identify two 15 minute blocks of your time within your average day when you can observe that you are being less productive. By effectively changing the way you presently use these 2 small blocks of time, in theory according to the Pareto principle you should be able to increase your personal productivity by up to a huge 80 percent. So you should work out in making the right solution to whatever is causing you problems and troubles. This should be your priority because it affects everything eventually as you work on different tasks and activities throughout the day. If you can fix these causes of your problems, then you can have more "inner peace," less distractions in mind and worries. As a result you can work better, faster and more inspired. You’ll even experience less tiredness at the end of the day too. Effective time management doesn’t mean you should give up all your free times or all the time that you currently spend for relaxation and enjoying your life. 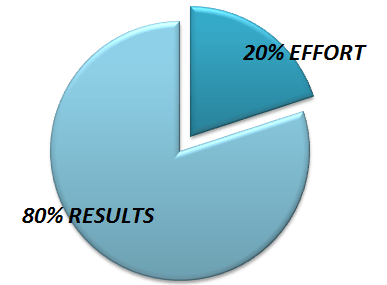 The purpose of the Pareto principle is to make things easier for you. Better personal time management helps you to set proper priorities for managing your time, eliminate wasted time and gain more control over how you can use this irreplaceable valuable resource. The modern methods of time management use different ways of recording time to help you identify the barriers to effective use of time. You are encouraged to develop short, medium and long term goals so you can organize your time and tasks well. The tools used in time management may include either digital or traditional sources such as organizers, planners and calendars. However, you need proper discipline and dedication to maximize your time in order for these tools to work well. Time management techniques such as "time boxing" may also assist you in pinpointing and eliminating the bad habits that interfere with your productive use of time. Methods like the Pareto principle, provide insight and encouragement in the development of new and better habits. This can improve the rate of performance and achievement. This will enable you to reach goals on a more regular basis. The Pareto principle is a basic time management technique that can increase your performance by simply starting on solving your personal and non-personal problems first so that things can work out better and smoother. This is a principle that is not usually thought of by those who want to improve their time management.